The need for an effective method of protecting yourself and your family in today's often hostile and violent environment is very real. While crime rates have recently been in decline, crime itself continues to be an ever present concern, because the police cannot protect you if you are attacked on the street. The best they can do is to attempt to arrest and punish criminals AFTER they have already victimized you. The ability to defend and protect yourself and family is ultimately a personal responsibility. The American Kenpo System is logical, practical and thorough. Armed with a knowledge of Kenpo you will be prepared to deal with a variety of attacks from all angles. The types of attacks Kenpo teaches to defend against fall into these major categories: grabs, pushes, punches, kicks, hugs and holds, locks and chokes, weapons, combinations and multiple opponents. The instructors and staff of Brian Duffy¹s Kenpo Karate are dedicated to developing each student¹s potential and increasing their proficiency to maximum levels. Today¹s lifestyles have become increasingly sedentary. Office jobs, while mentally taxing, do nothing for our bodies. Even traditional blue collar jobs that are physically demanding do not condition the body for better health. Children are not exempt from the problem either. With television increasingly occupying more and more of our children¹s time, physical inactivity becomes an ever present concern of interested parents. The study of Kenpo is a very invigorating endeavor that enables you to create and build energy in a focused and well directed manner. A careful mix of exercises designed to achieve Total Body Fitness, strengthen muscles, increase endurance, and develop flexibility have been included in your classes. The enhanced sense of vitality and energy that you will receive will benefit you in your work or school, allow you to rest better at night, and have more energy to enjoy other activities with family and friends. Besides more energy and vitality, the study of Kenpo will boost your physical coordination immensely. All movements and combination are executed on both sides of the body. This coupled with specific coordination drills and exercises cultivates major motor and fine motor skills to a point unequaled by any other endeavor. Self confidence and a positive mental attitude are acquired. The increased physical abilities that you will develop over time add to the positive mental image maturing within you. The sense of security from knowing that you are equipped with the knowledge and skills to effectively defend yourself and your loved ones brings with it a calm, quiet, and sincere confidence. Armed with this attitude an individual will not be afraid of the the opponent , but of what he can do to the opponent. Thus, he turns his back and walks away from an unwarranted conflict, confident that he could have been the victor. This confidence carries over to the meeting and beating of daily problems and challenges at work, home and school. Self discipline is the determination to perform a given task to the best of your ability. No one will dispute the importance of self discipline. A happy healthy, and productive life can not be accomplished without the development of this very important character trait. But self discipline is something that is developed slowly over a period of time. The achievement of setting and completing both short and long term goals (as demonstrated by stripe and belt promotions) reinforces the attributes of hard work and self discipline so necessary for success in life. 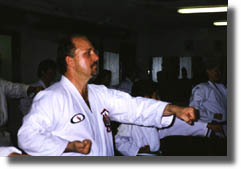 In training and as a sport, the practice of Kenpo is accompanied by centuries-old formalities that precede lessons, demonstrations, and practice sessions. These symbolize the mutual respect with which Kenpo students regard each other and their art. This respect carries over into everyday life as students quickly realize they have the obligation and responsibility to treat people and property in an appropriate manner. Everyone needs a place to channel aggressive energy into socially acceptable forms of friendly competition and personal competence. 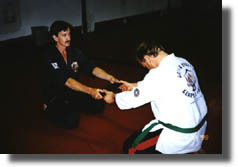 Brian Duffy¹s Kenpo Karate will provide a means to release tensions that are built up by the constant pressures of daily life. Creating the desire to achieve good school grades and to succeed on the job and in life. Taking pride in your accomplishments. Setting and completing short term goals.